Production on the L-3018 water-only waterjet has been going on simultaneously to the work on the L-3025-5. Both waterjets are being built for branches of the same company at two different locations in the United States. Recently, the waterjet tank was secured in between the side beams and the crossbeam was installed via overhead crane. Both on-loading and off-loading tables were also put in place in preparation for system integration. The next step for production will be the installation of the cutting head, which is a standard 2D water-only model on this particular waterjet, as well as the integration of the stainless steel chain that will help to automate the system. The L-3025-5 water-only waterjet is nearing completion as well, with the dual 5-Axis Infini Winder cutting heads installed and ready for operation. Final touches on the L-3025-5 include a guillotine door, safety guards, and optical eyes that will recognize when material reaches a designated spot on the table. 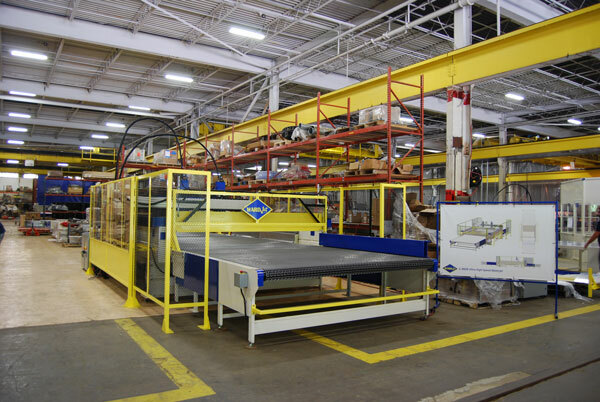 Once all the production is completed, WARDJet staff will run the machine on the floor to ensure the quality of the system before it leaves our facility. For more information on WARDJet’s L-Series water-only waterjets, visit the L-Series web page or contact a representative at 330-677-9100.